Therefore, we have to collect information about sending data. 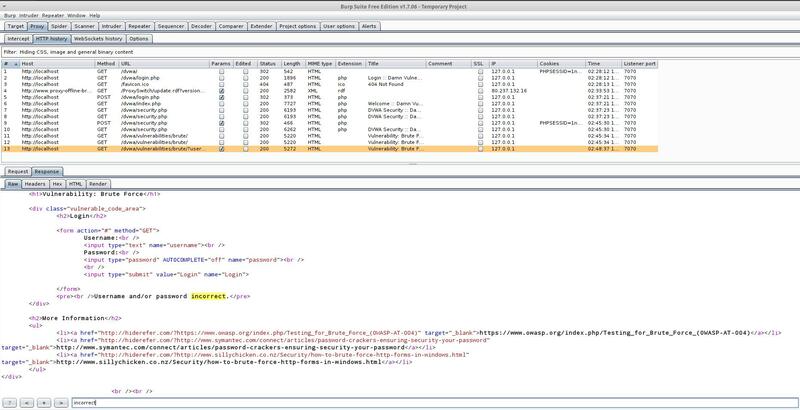 We can use audit of static source code of a target web page. However to analyze data transferring through a proxy is much more effective and easier. We will use Burp for this purpose. patator is able to brute-force a variety of services, but we will focus on online web forms. Website login page can transmit data using the GET or POST methods. In this article, we will consider brute force attack against website login page with GET on the example of the Damn Vulnerable Web Application (DVWA). In addition, we will brute force login page that transmits data using the POST method on the example of the OWASP Mutillidae II. I will work with these vulnerable web applications preinstalled in Web Security Dojo. As already mentioned, web forms can send data using the GET or POST method. This method is designed to obtain the required information and transfer data in the address bar. The name-value pairs are appended in this case to the address after the question mark and are separated by an ampersand (the & symbol). The convenience of using the get method is that the address with all parameters can be used repeatedly, saving it, for example, in the browser bookmarks, and also changing the parameter values ​​directly in the address bar. 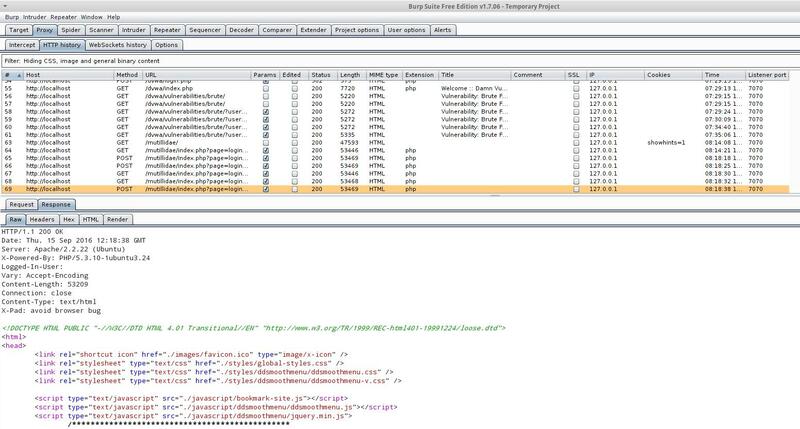 The post method sends data to the server in a browser request. This allows you to send more data than is available to the get method, since it has a limit of 4 KB. Large amounts of data are used in forums, mail services, database filling, file transfer, etc. Note the action="handler.php" - the value of this attribute indicates that the data will be sent to the file handler.php page. That is if I type in a text field, for example miloserdov, then after clicking on the ‘Send’ button the ./handler.php?str=hackware URI will open. If I enter into a text field, for example miloserdov, then after clicking the ‘Send’ button the ./handler.php page will open. The transmitted data is not displayed in the address bar. Do not be confused by forms that do not contain the method and/or action attributes. They are not mandatory. If they are not present, then the default values ​​are used. For method, this is get, and for action, the page of the form itself (that is, the data is sent to the same script/file that shows the form). It would seem that for it is quite logical for a web form to send exactly two fields: user name and password. However, often forms contain hidden fields and fields added on the fly. This is important to know, because even with the correct login and password the form will give an input error if there are no other required data. How do we know if we are logged in? That is, how to understand that the password was successfully guessed? To do this, the page which is sent after the login attempt is analyzed. Sometimes we cannot know what is shown after successful authorization, because we do not have a valid account. Therefore, we can use only the inverse method: we try to enter any login and password and look at the error. For example, it can be ‘Account does not exist’. Next, the brute force compares the pages it receives, and if there is no ‘Account does not exist’, it means that the password is cracked. Brute-force programs can also work with strings that are displayed when the input is successful. write the cookies (in the case of a valid login and password, the server sends cookies with session data, and based on these cookies, the web application shows the logged in user the edit button, the link to the admin panel, etc.). can be simplified versions: static cookies and static data in hidden form fields. This does not require receiving them at every login attempt. However, you need to remember to add the value of hidden fields to the body of the request, and about cookies remember that the session can expire and you need to get a new cookie. Some web applications contain user names (login) on their profile pages, sometimes as part of the profile page address, sometimes you need to use additional programs to identify logins (for example, for WordPress, this can be done by WPScan). You do not have to spare time for this. If it is possible to collect valid user logins, this will reduce brute-force time greatly in comparison, if we took the user names from a dictionary. As you should already guess, the complexity of the brute-force online page login arises from their diversity; each web site requires an individual approach. # sudo apt dist-upgrade # if you wish, you can perform a complete system upgrade. If you did, then reboot after this step before continuing. Also, note that I updated Damn Vulnerable Web Application (DVWA) and Damn Vulnerable Web Application (DVWA) to the latest versions. How to do this is described on the corresponding pages on the links given above. You need to start by collecting data about the operation of the web form. Analyzing static data (HTML code) can be difficult and very easy to miss some fields. Therefore, we will analyze the ‘live’ data that the browser sends. For this kind of analysis, we need a proxy. 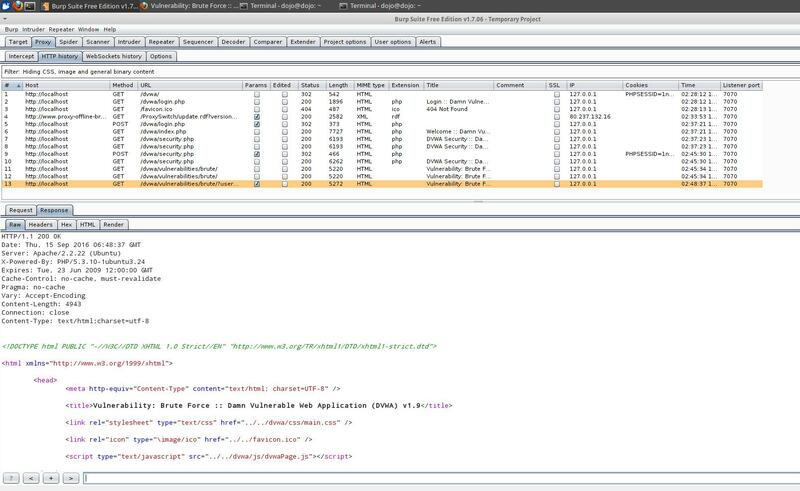 We will use the Burp Suite Free Edition. Go to the tab Proxy -> Options. There, at the very top of the Proxy Listeners, click Add and add a new listener: on any unused port, for example, 7070. For Specific Address, select the IP of the attacker’s computer (that is, the machine where Burp is running). 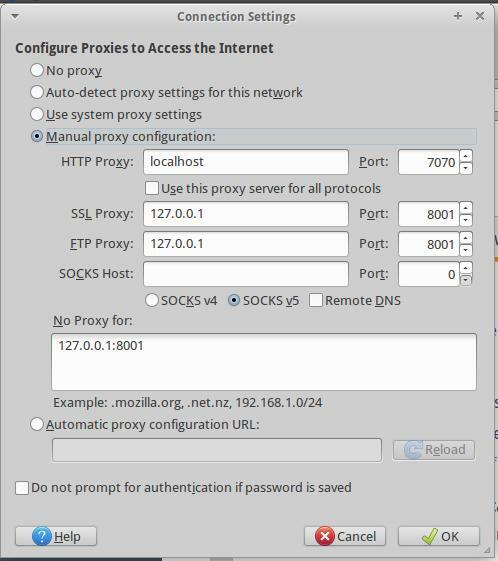 Now go to Proxy -> Intercept, disable it. Now in your web browser open Settings -> Advanced -> Network -> Connections Settings. 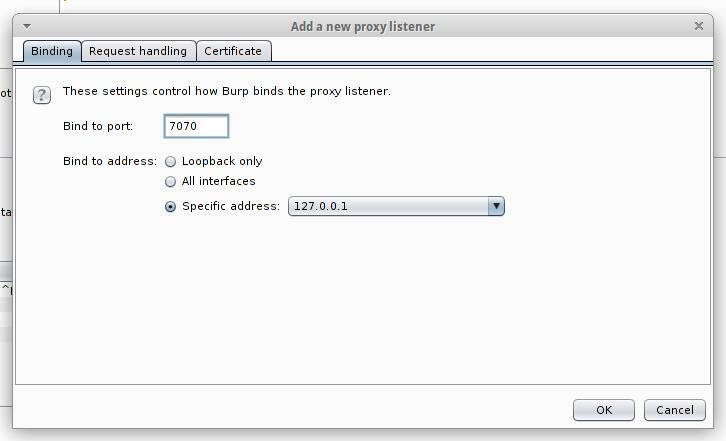 There, select Manual Proxy Configuration and in the HTTP Proxy fields, type the proxy IP and port (which Burp Suite listens to). Please note that we require a login and password to log in. We will not bruete-force this form (although nothing would stop us from doing this). This form serves access to the DVWA, the pages of which contain vulnerable web applications, including those that are designed to login, but from which we do not know the passwords. For this first web form, we have credentials (username/password pair). So we will just enter them. Most likely, after this, cookies will be written to our browser. With each access to DVWA pages, the server will request cookies and check whether there is such a session. If there is a session, we will view the DVWA pages. It is very good that we paid attention to this, because we need to configure our programs for brute-force so that they send cookies with a valid session, otherwise they will not be able to ‘communicate’ with internal DVWA pages that contain the web form we want brute forcing. Go to the Brute Force tab. according to the address http://localhost/dvwa/vulnerabilities/brute/?username=admin&password=password11&Login=Login# the server uses the GET method. By the way, the fact that the form sends the values ​​of some values ​​by the GET method does not mean that it does not send POST values ​​at the same time. When I faced the task of implementing the simultaneous sending of data using the GET and POST method using AJAX, the task turned out to be quite simple in the solution. In this case, the data is sent only by the GET method, but remember that there may be more unusual options. The second content is the cookies, without which we will not be allowed to enter the server’s internal pages. Therefore, we have to send cookies to the server with every request. However, this web application does not check Referer, so we do not need to specify this header. We have collected enough data, we proceed to combine a to run the brute force. patator is intended for brute-force of a large number of various services (and not only services, by the way). For the brute-force input of web applications, the module http_fuzz is intended. condition  := "code" | "size" | "time" | "mesg" | "fgrep" | "egrep"
encoding   := "unhex" | "sha1" | "b64" | "url" | "hex" | "md5"
Let us start building our patator command to crack passwords. It will start with ./patator.py http_fuzz, here ./patator.py is the location of the script file, and http_fuzz is the name of the module being used. As we remember, the /dvwa/vulnerabilities/brute/?username=admin&password=password11&Login=Login string is passed to the server, the string is the relative address of the page. The absolute address in our case looks like this: http://localhost/dvwa/vulnerabilities/brute/?username=admin&password=password11&Login=Login. We specify this address with the url option: url="http://localhost/dvwa/vulnerabilities/brute/?username=admin&password=password11&Login=Login"
The word admin is replaced with the placeholder FILE0 and instead of password11 we specify the second placeholder FILE1. As a result, the address we will query each time on the web server and which we specify with the url option becomes: url="http://localhost/dvwa/vulnerabilities/brute/?username=FILE0&password=FILE1&Login=Login"
We also need to specify the location of the files with usernames and passwords. Note, instead of FILE0 and FILE1, the abbreviated record 0= and 1= is used. The files are located in the same directory as the patator script, so I add 0=namelist.txt 1=password_medium.txt to our launch command. Note that if you try to use the same command for Web Security Dojo in the Damn Vulnerable Web Application (DVWA), download the same dictionaries that I use, then you still will not succeed! Since you need to change the value of 1n3b0ma83kl75996udoiufuvc2 (cookies) to your own. To see the progress in the program itself, press [ENTER]. To view all available interactive commands, press h.
On the one hand, we have completed the basic task and found the administrator password. However, we did not find any (out of four) of the user’s passwords. The speed of the cracking was 264 tested combinations per second. The photo is located at http://localhost/dvwa/hackable/users/admin.jpg. 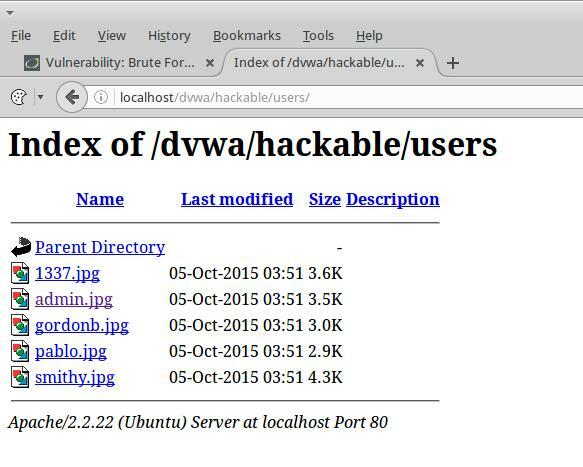 And what if we look in the http://localhost/dvwa/hackable/users/ folder? Well, finally I succeeded. Literally, in a matter of seconds, I cracked passwords for three accounts of four. On the screenshot there are false positives when there are special symbols in the password. This could mean that there is another vulnerability, for example, SQL injection. If you tried brute-force web forms, when they transmit data using the GET method, and you succeeded, then the POST method should also not have any special problems. Now the address of the page will be static (it will not change), and to specify the transmitted data we will use a special option. Perhaps this is the biggest difference. Now let us move on to the brute force web login page when the data is sent using POST. I will practice in OWASP Mutillidae II, installed in Web Security Dojo. when credentials is wrong, the ‘Password incorrect’ is displayed. They tell us that the data is transferred by the POST method to the page /mutillidae/index.php?page=login.php. Also the cookies are transmitted, which contain ‘PHPSESSID=1n3b0ma83kl75996udoiufuvc2’. The data itself is in the form: ‘username=admin&password=password&login-php-submit-button=Login’. There are no redirects or new cookies. We begin to compose our command. It starts with ./patator.py http_fuzz (program file and the module being used). Next, with the url option, we specify the address of the page to which the data is sent: url="localhost/mutillidae/index.php?page=login.php"
Since we already have some cookies, they were automatically recorded, most likely when the site was first opened. It is unclear how often they will change, but it is clear that this will happen automatically, as well as the first time, so we specify: accept_cookie=1. This option means to accept cookies from the web application and send them at the next login and password check. With my options, sometimes there was an 500 Internal Server Error, which in this situation means only that I DoSed the server. patator is able to brute force website login page with any degree of complexity of transmitted requests. The flexibility of the patator allows performing brute-force in circumstances that Hydra and Medusa would not.